We are staying at the Compass Parkview in Saigon, Vietnam. As part of my Pampered Package I receive weekly massages, manicures and pedicures. One week, as a surprise, my manicurist brought me some tasty banana sheets. What are these? You might ask. A vendor slices bananas lengthwise into narrow strips and places them on a grill to heat. Because of the sugar in the banana strips, they begin to adhere together and eventually form a flattened grilled “sheet” of crispy bananas. They are surprisingly delicious! We liked them so much that when our gift package ran out, we began the search to purchase more. For the next several days, we went from store to store but we couldn’t locate this tasty treat. 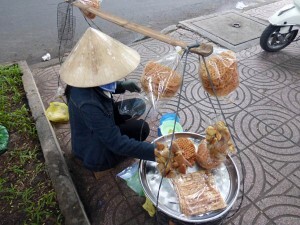 Then one day when we walked outside our residence, we saw a vendor cooking up waffles and banana sheets! What luck! Since I don’t speak Vietnamese, sign language had to suffice and I found out that a package of these yummy delights cost 24,000VND or just over a dollar. I bought two! And now I’m all set to enjoy a local delicacy at my leisure. This entry was posted in About us, Indigenous Life, Travel Tips and Insight and tagged Contributions of women, daily life, indigenous culture, Travel. Bookmark the permalink.